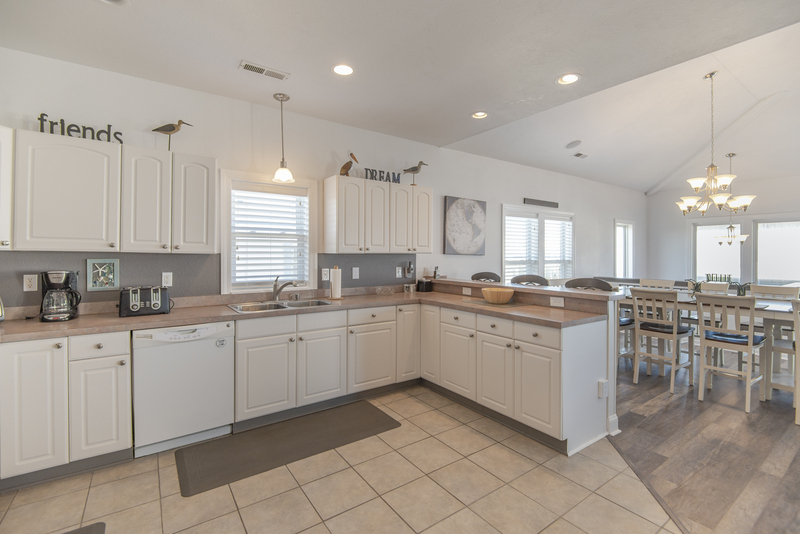 Enjoy all the Comforts & Great Ocean Views that this outstanding Kitty Hawk Vacation Home has to offer. The Spacious Floor Plan provides plenty of room for rest & relaxation while numerous amenities await your family including a Private Solar-Heated Swimming Pool (16x24), Hot Tub, Elevator, Large Den/Game Room w/Pool Table and Foosball, and a short 300 ft. walk to the Beach w/Direct Access (1 Block). "Ocean Butterfly II" is a terrific home that features lovely decor, comfortable furnishings and is very well equipped. Ground Level: Parking for 4 Cars, Enclosed Outside Shower, Covered Entry, Elevator, Mini-Split AC/Heat System, Large Den/Game Room w/Pool Table, Foosball, Gaming TV, DVD, Access to Patio Area, Private Solar-Heated Swimming Pool (Heated at No Additional Charge. Please Bear in Mind That Pool Temperature is Subject to Outside Temperatures & Conditions), Hot Tub, & Charcoal Grill. Mid Level: 4 Bedrooms - All have TV w/Digital Cable & HBO, Cinemax, & Showtime (1 Master Suite w/King, TV, DVD, & Full Bath, 1 Master Suite w/Queen, TV, & Full Bath, 1 w/Queen, TV, DVD, 1 w/Duo Bunk & 1 Bunk Set, TV, & DVD), Full Hall Bath, Laundry Area, Small Den, Ocean Views, & Covered Deck. Top Level: Open & Spacious Living Area w/TV w/Digital Cable & HBO, Cinemax, & Showtime, DVD/Stereo, Cathedral Ceiling, Electric Fireplace, Dining/Kitchen Areas, Half Bath, Master Suite w/King, TV w/Digital Cable & HBO, Cinemax, & Showtime, DVD, & Full Bath, & Wonderful Ocean Views from Sun Deck. Features include: C/AC & Heat Throughout, Washer/Dryer, Dishwasher, Microwave, Phone, 6 TVs, 5 DVDs, 2 Stereos, Wireless Internet, Baby Equipment (High Chair, Booster Seat, Baby Gate), Ceiling Fans, Pool & Deck Furniture. No Pets. This is a Non-Smoking Unit. For 2019 -Observation Deck & Porch Swing being removed, Gas Fireplace will convert to Electric, Double Futon being replaced with Queen Sleep Sofa, Arcade games will be removed. Overall very pleased with the layout and location. Excellent beach access! Fantastic house! We loved all the fun additions like the pool, the slot machine, and the Smart TV (which enabled us to log onto our Netflix account). We appreciated how well-equipped the kitchen was for preparing meals - we were worried that there'd be no pots, pans, etc. but it was well-stocked - thank you for that! We also loved the extra large dining room table. All of the improvements are wonderful and much appreciated. Love the hooks for hanging jackets & towels! It would be helpful to have a wet bar on the first floor. This is a beautiful and comfortable home. It had everything we needed and then some. We so enjoyed our stay at Ocean Butterfly II! Thank you for sharing your home! It is a beautiful home and great location.